哪種範例資料可搭配 Power BI 使用？What sample data is available to use with Power BI? 您是否剛接觸 Power BI 並想要試用，但沒有任何資料；Say you're new to Power BI and want to try it out but don't have any data. 或您可能有資料集，但因為 (還) 不了解 Power BI 的運作方式，而擔心可能會不小心損害資料集？Or maybe you have a dataset, but because you don't understand (yet) how Power BI works, you worry that you might somehow damage your dataset? 不必煩惱！No need to stress out! obviEnce (www.obvience.com) 和 Microsoft 建立了範例供您使用，直到您更熟悉 Power BI 為止。obviEnce (www.obvience.com) and Microsoft have created samples for you to use until you feel more comfortable with Power BI. 資料經匿名處理，並代表了不同產業：財務、HR、銷售等。The data is anonymized and represents different industries: finance, HR, sales, and more. 在您閱讀線上文件的同時，會發現教學課程與範例使用這些相同範例，這表示您將能夠跟著進行。And as you read through our online documentation you'll discover tutorials and examples that use these same samples which means that you'll be able to follow along. 這些範例均以數種格式提供：內容套件、個別 Excel 活頁簿及 .pbix 檔案。Each of these samples is available in several formats: as a content pack, as an individual Excel workbook, and as a .pbix file. 如果您不了解這些是什麼，或如何開始使用，也不必擔心。If you don't know what these things are, or how to get your hands on them -- don't worry. 我們會在本文稍後詳加說明。We'll explain it all later in this article. 我們為各個範例建立了「導覽」，這種文章會說明範例背後的案例，並帶您瀏覽不同案例。And for each sample we've created a tour which is a type of article that tells the story behind the sample and walks you through different scenarios. 也許會有一個案例回答您經理的問題、另一個則會談討競爭力解析，或建立報表及儀表板以供共用、或說明業務轉換。One scenario might be answering questions for your manager, another might be looking for competitive insights, or creating reports and dashboards to share, or explaining a business shift. 但在開始之前，請先閱讀這些使用範例的法律規範。But before we get started, please read through these legal guidelines for using the samples. 當您完成時，我們會向您介紹範例及示範使用方式。When you're done we'll introduce the samples and show you how to use them. 請先閱讀本資訊再使用 Power BI 範例。Please read this information before using the Power BI samples. ©2015 Microsoft Corporation.©2015 Microsoft Corporation. 著作權所有，並保留一切權利。All rights reserved. 文件和活頁簿皆以「現況」提供。The documents and workbooks are provided "as-is." 活頁簿中呈現的資訊和檢視，包括 URL 及其他網際網路網站參考資料，可能會變更，恕不另行通知。Information and views expressed in the workbooks, including URL and other Internet Web site references, may change without notice. 貴用戶須自行承擔使用風險。You bear the risk of using it. 部分範例僅供示範，均屬虛構，Some examples are for illustration only and are fictitious. 亦沒有任何預定或推斷的實際關聯。No real association is intended or inferred. 針對此處提供的資訊，Microsoft 不做任何明示或默許的擔保。Microsoft makes no warranties, express or implied, with respect to the information provided here. 活頁簿不會提供您任何 Microsoft 產品的任何智慧財產權法定權利。The workbooks do not provide you with any legal rights to any intellectual property in any Microsoft product. 您可以複製並使用此活頁簿以供內部參考之用。You may copy and use this workbook for your internal, reference purposes. ObviEnce 是一家 ISV 和 Microsoft Business Intelligence 的智慧財產權 (IP) 提供機構。ObviEnce is an ISV and an Intellectual Property (IP) Incubator focused on Microsoft Business Intelligence. ObviEnce 與 Microsoft 密切合作以開發最佳作法，亦建立開始與部署 Microsoft Business Intelligence 解決方案的概念領導地位。ObviEnce works closely with Microsoft to develop best practices and thought leadership for jump-starting and deploying Microsoft Business Intelligence solutions. 活頁簿和資料皆為 obviEnce LLC 的財產，並僅供以業界範例資料示範 Power BI 功能的目的而共享。The workbooks and data are property of obviEnce, LLC and have been shared solely for the purpose of demonstrating Power BI functionality with industry sample data. 任何活頁簿及/或資料 (包括每個活頁簿包含之資訊工作表) 的使用皆必須包含上述歸屬聲明。Any uses of the workbooks and/or data must include the above attribution (that is also on the Info worksheet included with each workbook). 活頁簿和任何視覺效果亦必須提供下列著作權聲明：obviEnce ©。The workbook and any visualizations must be accompanied by the following copyright notice: obviEnce ©. 按一下下方任一連結下載 Excel 活頁簿檔案或 .pbix 檔案，即表示您同意上述條款。By clicking any of the links below to download the Excel workbook files or .pbix files, you are agreeing to the terms above. 有八個範例供您使用。Eight samples are available for you to use. 每個各代表一種不同產業。Each one represents a different industry. 這個產業範例會分析財務長對其主管、產品和客戶的關鍵計量。This industry sample analyzes a CFO's key metrics for her executives, products, and customers. 您可以調查哪些因素會影響公司的獲利率。You can investigate what factors impact the company's profitability. 這個產業範例藉由分析新進員工、現有員工和離職員工，著眼於公司的招聘策略。This industry sample focuses on the hiring strategy for a company by analyzing new hires, active employees, and employees who've left. 透過瀏覽資料，您可以找到自願離職的傾向與招聘策略的趨勢。By exploring the data, you can find trends in voluntary separations and biases in the hiring strategy. 在這個產業範例中，我們分析公司 IT 部門的規劃成本與實際成本。In this industry sample we analyze the planned vs. actual costs of the IT department of a company. 這項比較可幫助我們了解公司的年度計畫是否得當，並可針對大大偏離計畫的領域進行調查。This comparison helps us understand how well the company planned for the year and investigate areas with huge deviations from the plan. 此範例中的公司，會經歷一年一度的計畫週期，然後按季產出新的「最新估計」(LE) 來協助分析 IT 支出於會計年度的變化。The company in this example goes through a yearly planning cycle, and then quarterly it produces a new Latest Estimate (LE) to help analyze changes in IT spend over the fiscal year. 這個產業範例會探討軟體公司的銷售通路。This industry sample explores a software company's sales channel. 業務經理依地區、交易大小和通路追蹤商機和營收，藉此監控他們的直接與合作夥伴銷售通路。Sales managers monitor their direct and partner sales channels by tracking opportunities and revenue by region, deal size, and channel. 這個產業範例會分析在多個門市和區域售出之品項的零售資料。This industry sample analyzes retail sales data of items sold across multiple stores and districts. 計量會比較今年與去年在以下領域的表現：銷售、單位、毛利率和變異數，以及新門市分析。The metrics compare this year's performance to last year's in these areas: sales, units, gross margin, and variance, as well as new store analysis. 這個產業範例會分析製造公司 VanArsdel Ltd。它可讓行銷長觀察產業與 VanArsdel 的市場占有率。This industry sample analyzes a manufacturing company, VanArsdel Ltd. It allows the Chief Marketing Officer to watch the industry and the market share for VanArsdel. 透過瀏覽範例，您可以找到這家公司的市場佔有率、生產量、銷售和情緒指數。By exploring the sample, you can find the company's market share, product volume, sales, and sentiment. 這個產業範例著重在傳統供應鏈的其中一項挑戰：供應商品質的分析。This industry sample focuses on one of the typical supply chain challenges — supplier quality analysis. 有兩個主要的計量會在此分析中發揮作用：缺失總數和缺失所造成的停工期總計。Two primary metrics are at play in this analysis: total number of defects and the total downtime that these defects caused. 這個範例有兩個主要目標：找出品質最佳與最差的供應商，以及找出哪家工廠表現最好，能找到缺點並加以移除，將停工期降到最低。This sample has two main objectives: understand who the best and worst suppliers are, with respect to quality, and identify which plants do a better job finding and rejecting defects, to minimize downtime. 您現在知道可用的內容了。Now you know what's available. 接下來該了解如何取得這些範例。Time to learn how to get ahold of these samples. 如上方所述，範例以數種格式提供：內容套件、Excel 活頁簿及 .pbix 檔案。As you read above, the samples are available in several formats: content packs, Excel workbooks, and .pbix files. 我們會從內容套件開始，說明這些格式的使用方式。We'll describe how to use each of these, starting with content packs. 內容套件是唯一可以從 Power BI 中取得的範例格式；您不需要離開 Power BI 就能找到。Content packs are the only sample format that is available from within Power BI; you don't have to leave Power BI to find them. 內容套件基本上是某人建立的一或多個儀表板、資料集和報表組合，可以搭配 Power BI 服務使用。A content pack is essentially a bundle of one or more dashboard, dataset, and report that someone creates and that can be used with Power BI service. 人們會建立內容套件，與同事共用。People create content packs to share with colleagues. 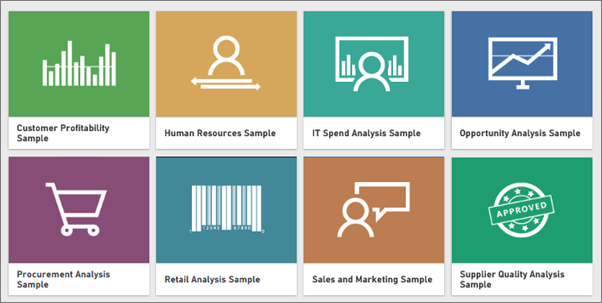 每個 Power BI 範例內容套件都包含一個資料集、報表和儀表板。Each of the Power BI sample content packs contains a dataset, report, and dashboard. 內容套件不適用於 Power BI Desktop。Content packs are not available for Power BI Desktop. 如果您想深入了解內容套件，請參閱 Power BI 中的內容套件簡介。If you'd like to learn more about content packs, read Intro to content packs in Power BI. 開啟 Power BI 服務 (app.powerbi.com) 並登入。Open Power BI service (app.powerbi.com) and log in. 在左下角選取 [取得資料]。In the bottom left corner select Get data. 在顯示的 [取得資料] 頁面上，選取 [範例]。On the Get Data page that appears, select the Samples icon. 選取其中一個範例以開啟該範例的描述。Select one of the samples to open a description of that sample. 接著選擇 [連線]。Then choose Connect. Power BI 會匯入內容套件，並將新的儀表板、報表及資料集新增到您目前的工作區。Power BI imports the content pack and adds a new dashboard, report, and dataset to your current workspace. 新的內容會以黃色星號標示。The new content is marked with a yellow asterisk. 使用範例讓 Power BI 進行測試回合。Use the samples to take Power BI for a test run. 現在您有了資料，可以開始進行。Now that you have data, you're on your way. 使用範例內容套件試試幾個教學課程，或直接開啟 Power BI 服務及探索。Try out some of our tutorials using the sample content packs or just open Power BI service and explore. 每個範例內容套件也都能以 Excel 活頁簿形式提供。Each of the sample content packs is also available as an Excel workbook. 這些 Excel 活頁簿經過設計，可與 Power BI 服務搭配使用。The Excel workbooks are designed to be used with Power BI service. 請使用下方連結個別下載檔案，或下載所有範例檔案的 ZIP 檔案。Download the files individually using the links below, or download a zip file of all the sample files. 如果您是進階使用者，可能必須下載 Excel 活頁簿以探索或編輯資料模型。If you're an advanced user, you might want to download the Excel workbooks to explore or edit the data models. 儲存下載的檔案。Save the downloaded file. 檔案的儲存位置會有差異。Where you save the file makes a difference. 本機 - 如果您將檔案儲存到電腦上的本機磁碟或組織中的其他位置，您可以從 Power BI 將檔案匯入至 Power BI。 Local - If you save your file to a local drive on your computer or another location in your organization, from Power BI, you can import your file into Power BI. 您的檔案實際上會保留在本機磁碟，因此不是真的將整個檔案匯入 Power BI。Your file will actually remain on your local drive, so the whole file isn’t really imported into Power BI. 真正發生的情況是在 Power BI 網站中建立新的資料集，並將資料和資料模型 (在某些情況下) 載入資料集。What really happens is a new dataset is created in your Power BI site and data, and in some cases the data model, are loaded into the dataset. 如果您的檔案有任何報表，這些報表會顯示在 Power BI 網站的 [報表] 下。If your file has any reports, those will appear in your Power BI site under Reports. OneDrive - 商務 - 如果您有商務用 OneDrive，並使用與用來登入 Power BI 相同的帳戶進行登入，這樣做可以有效地讓 Excel、Power BI 中的工作或 .CSV 檔案，與 Power BI 中的資料集、報表和儀表板保持同步。 OneDrive - Business – If you have OneDrive for Business and you sign into it with the same account you sign into Power BI with, this is by-far the most effective way to keep your work in Excel, Power BI, or a .CSV file in-sync with your dataset, reports, and dashboards in Power BI. 由於 Power BI 和 OneDrive 都在雲端，因此 Power BI 每隔約一小時就會連接到您在 OneDrive 上的檔案。Because both Power BI and OneDrive are in the cloud, Power BI connects to your file on OneDrive about every hour. 如果發現任何變更，便會自動更新 Power BI 中的資料集、報表和儀表板。If any changes are found, your dataset, reports, and dashboards are automatically updated in Power BI. OneDrive - 個人 - 如果您將檔案儲存到自己的 OneDrive 帳戶，則可以利用許多與使用商務用 OneDrive 相同的優點。 OneDrive - Personal – If you save your files to your own OneDrive account, you’ll get many of the same benefits as you would with OneDrive for Business. 最大的差異是當您第一次連接到檔案時 (使用 [取得資料] > [檔案] > [OneDrive - 個人])，需要使用 Microsoft 帳戶登入 OneDrive，這通常與用來登入 Power BI 的帳戶不同。The biggest difference is when you first connect to your file (using Get Data > Files > OneDrive – Personal) you’ll need to sign in to your OneDrive with your Microsoft account, which is usually different from what you use to sign in to Power BI. 當您使用 Microsoft 帳戶登入 OneDrive 時，請務必選取 [讓我保持登入] 選項。When signing in with your OneDrive with your Microsoft account, be sure to select the Keep me signed in option. 如此一來，Power BI 每隔約一小時就會連接到您的檔案，以確保您在 Power BI 中的資料集保持同步。This way, Power BI will be able to connect to your file about every hour and make sure your dataset in Power BI is in-sync. 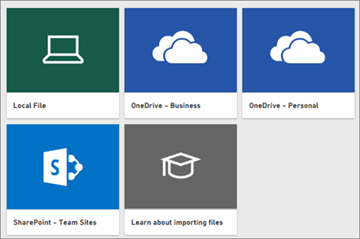 SharePoint 小組網站 - 將 Power BI 檔案儲存到 SharePoint - 小組網站與儲存到商務用 OneDrive 大致相同。 SharePoint Team-Sites Saving your Power BI files to SharePoint – Team Sites is much the same as saving to OneDrive for Business. 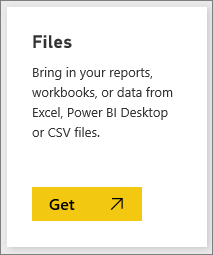 最大的差異是從 Power BI 連接到檔案的方式。The biggest difference is how you connect to the file from Power BI. 您可以指定 URL 或連接到根資料夾。You can specify a URL or connect to the root folder. 這時候，您可能必須建立新儀表板，並以您打算匯入的檔案為其命名。At this point you may want to create a new dashboard and name it after the file you plan on importing. 否則，當您匯入 Excel 資料集時，Power BI 不會建立以範例命名的新儀表板，而會將磚新增到您目前開啟的儀表板。Otherwise, when you import the Excel dataset, Power BI won't create a new dashboard named after the sample but instead will add a tile to the dashboard that you currently have open. 選取該磚會帶您前往資料集的報表。Selecting that tile will take you to the dataset's report. 因為您之後可以隨時建立新的儀表板，所以這並不是大問題，但從新的儀表板開始進行，能讓您省下一或兩個步驟。This isn't a major big deal as you can always create a new dashboard later, but starting with a new dashboard saves you a step or two. 在顯示的 [取得資料] 頁面上，選取 [檔案] > [取得]。On the Get Data page that appears, select Files > Get. 瀏覽到您下載及儲存範例的位置。Navigate to the location where you downloaded and saved the sample. 選取檔案，在這個案例中是儲存在商務用 OneDrive 的 Procurement Analysis Sample.xlsx，然後選擇 [連線]。Select the file, in this case Procurement Analysis Sample.xlsx which was saved on OneDrive for Business, and choose Connect. 選擇要匯入資料，還是要將活頁簿帶入 Power BI 以查看其在 Excel Online 中的實際呈現方式。Choose whether to import the data or to bring the workbook into Power BI and see it exactly as it is in Excel online. 如果您選取 [匯入]，Power BI 會匯入範例活頁簿，並將其新增為新資料集，名為 Procurement Analysis Sample。If you select Import, Power BI imports the sample workbook and adds it as a new dataset named Procurement Analysis Sample. 如果活頁簿有任何 Power View 工作表、資料表或範圍，或有資料模型，Power BI 也會建立報表 (名稱相同)。If the workbook has any Power View sheets, tables or ranges, or a data model, Power BI also creates a report (with the same name). 如果您尚未開啟任何儀表板，Powrer BI 會建立新的儀表板。And if you don't already have a dashboard open, Power BI creates a new dashboard. (如果您在按一下 [取得資料] 時開啟了儀表板，將會在該儀表板上看到新的空白磚。(If you had a dashboard open when you clicked Get Data, you'll see a new blank tile on that dashboard. 按一下該磚，您就會前往剛新增的資料集之報表)。Clicking that tile will take you to the report for the dataset you just added). 新的內容會依範例命名，並以黃色星號標示。The new content is named after the sample and is marked with a yellow asterisk. 當 [您的資料集已就緒! ]When the Your dataset is ready! 畫面出現時，請選取 [檢視資料集] 或 [取得深入資訊摘要]，也可以直接使用 Power BI 左邊瀏覽列找出並開啟相關報表或儀表板。screen appears, select View dataset or Get Quick Insights or simply use your Power BI left navbar to locate and open the associated report or dashboard. 想了解 Excel 活頁簿中的資料如何轉換為 Power BI 資料集和報表嗎？Want to understand how the data in an Excel workbook gets converted to Power BI datasets and reports? 在 Excel 中開啟 Excel 範例，瀏覽工作表就會得到一些答案。Opening the Excel samples in Excel and exploring the worksheets provides some of the answers. 第一次在 Excel 中開啟範例活頁簿時，您可能會看到兩個警告。When you first open a sample workbook in Excel, you may see two warnings. 第一個警告說明活頁簿是在受保護的檢視狀態中。The first says the workbook is in Protected View. 選取 [啟用編輯] 。Select Enable Editing. 第二個警告可能指出活頁簿具有外部資料連線。The second may say that the workbook has external data connections. 選取 [啟用內容] 。Select Enable Content. 每個活頁簿都包含數個工作表。Each workbook contains several sheets. 因為這些 Excel 範例至少都有一個具視覺效果的 Power View 工作表，所以當您將 Excel 檔案匯入 Power BI 中時，會得到一個資料集和一個報表。Because these Excel samples all have at least one Power View sheet with visualizations, when you import the Excel file into Power BI you'll end up with a dataset and a report. 您可能需要啟用 Power View 增益集。You may need to enable the Power View add-in. 實際資料會位在何處？So where's the actual data? Power Pivot 資料模型中。It's in the Power Pivot data model. 若要查看資料，請在 [PowerPivot] 索引標籤中選取 [管理資料模型] 。To see the data, on the PowerPivot tab, select Manage Data Model. 沒看到 [PowerPivot] 索引標籤？Don't see the PowerPivot tab? 啟用 Power Pivot 增益集。Enable the Power Pivot add-in. [資訊] 索引標籤提供建立此範例之 obviEnce 公司的相關資訊。The Info tab provides information about obviEnce, the company that created the sample. 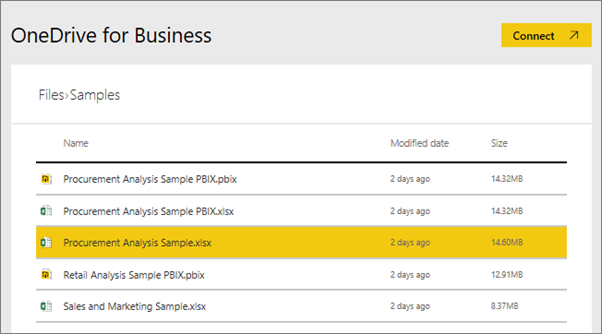 每個範例內容套件也都能以 Power BI .pbix 檔案形式提供。Each of the sample content packs is also available as Power BI .pbix file. .pbix 檔案的設計目的是搭配 Power BI Desktop 使用。The .pbix files are designed to be used with Power BI Desktop. 使用下方連結個別下載檔案。Download the files individually using the links below. 選取這些連結會自動將檔案儲存至您的 [下載] 資料夾。Selecting these links saves the file automatically to your Downloads folder. 從 Power BI Desktop 中，選取 [檔案] > [開啟]，然後巡覽到您儲存範例 .pbix 的位置。From Power BI Desktop, select File > Open and navigate to the location where you saved the sample .pbix. 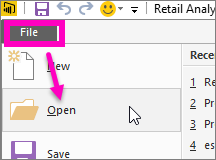 選取 .pbix 檔案，以在 Power BI Desktop 中加以開啟。Select the .pbix file to open it in Power BI Desktop.